Monday 11 May marked the start of the popular Semaine du Golfe in Vannes; a seven-day gathering of traditional and classic yachts, which showcases the maritime dynamism of south-west Brittany. Just nearby, at the Multiplast yard, it was also the day chosen by Gitana Team to set its compass to the future. 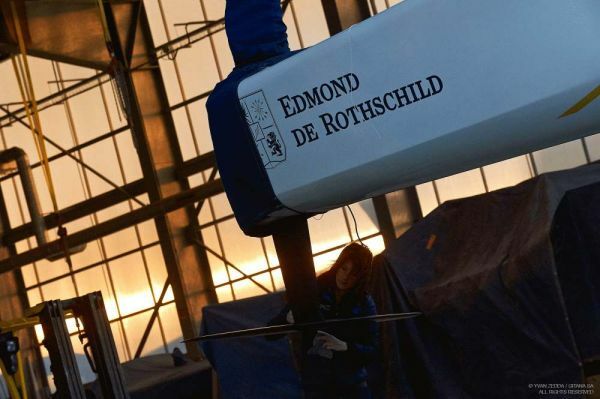 To the near future first of all, by lifting the veil on the forms and livery of the Mono60 Edmond de Rothschild, one of the new Verdier / VPLP designs for the next Vendée Globe. The launch of this latest generation Imoca is scheduled for some time in July. This visit to the yard in Vannes was also an opportunity to look at the bigger picture in more ways than one, with a rather ‘significant’ announcement for the racing stable fitted out by Baron Benjamin de Rothschild. Cyril Dardashti, the team’s General Manager, accompanied by the skipper Sébastien Josse and the entire Gitana design office, revealed the stable’s programme for the next five years, notably announcing the launch of the construction of a new generation maxi-multihull. Over the past fifteen years, Baron Benjamin de Rothschild has been one of the major players on the French sailing circuit. By creating the Gitana Team in 2000, he has transformed what was a family passion initiated by his forebears back in 1876 on the shores of Lake Geneva into a school of excellence. Whilst it is set to celebrate its 140th anniversary next year, the Gitana legend is a reflection of its creators: innovative, modern and resolutely geared towards the future. Renowned entrepreneurs and huge fans of technology, Ariane and Benjamin de Rothschild didn’t think twice about supporting the team when the latter chose to go off the beaten track in the Route du Rhum 2014. Indeed, up against a line-up of oceanic giants measuring 30 to 40 metres, Gitana Team was banking on the addition of T-foil rudders on its 23-metre trimaran to stand up to its massive rivals. The upshot of this was a remake of David and Goliath, which resulted in an outstanding 3rd place posted by Sébastien Josse. This result not only consolidated the team’s research, it also prompted it to switch to the second phase of its initial project: namely the bid to get the offshore trimaran airborne. In this way, on 22 April 2015, the Gitana Team launched a reiteration of the Multi70 Edmond de Rothschild. Over the course of the winter, the trimaran was kitted out with asymmetric foils (L-foils to port, C-foils to starboard) and some new, more substantial T-foil rudders. Since that time, Sébastien Josse and his men have been linking together the sea trials and the platform has become a genuine 2/3 scale test laboratory; a ‘luxury’ that Sébastien Josse is very much aware of: “During the Route du Rhum, the gains observed on the platform were really encouraging, whilst the T-foil rudders were just one step on the journey towards our goal. Indeed, sustaining a 70-foot trimaran offshore single-handed is already a challenge in itself, but getting her to fly is something else entirely! With this 2015 version, we’re entering a whole new dimension; a period of essential fine-tuning and testing for the next stage in Gitana Team’s projects. The theoretical studies and simulations are essential, but they will never be enough on their own as nothing can replace practical time out on the water. We’re incredibly lucky to be able to test the architectural possibilities in real situations on the Multi70 Edmond de Rothschild. There are still so many unknowns about how the new features handle in big seas and over a long distance, that all our sea trials offer us the chance to record what is truly invaluable data for us,” explained the skipper of Edmond de Rothschild. Since January 2014 and the presentation of the Mono60 Edmond de Rothschild project, the Gitana Team has made no secret of its interest in a maxi-multihull, but the five-arrow team has allowed itself the time to mull over this XXL project. This new craft, which will measure between 31 and 35 metres, boasts ambitious specifications. The maxi-multihull will initially be geared up for a round the world via the three capes and she will have to be able to be helmed in crewed as well as solo configuration. However, the singularity of this new Gitana will actually lie in her versatile nature, namely Archimedean as well as flying in certain phases of navigation. To take up this gauntlet, the Gitana Team’s design office, managed by Antoine Koch, has banked on both talent and loyalty by entrusting the design of the future maxi Gitana to the naval architect Guillaume Verdier and his associates (Hervé Penfornis, Romaric Neyhousser as well as Morgane Schlumberger). As was the case for the modifications to the Multi70 Edmond de Rothschild, Verdier’s firm will work closely with American Bobby Kleinschmit, as well as the Pure Design company, all of whom are members of Team New Zealand. Finally, the overview of this skills hub wouldn’t be complete without mentioning Len Imas who, with the assistance of Romain Garo, is responsible for the fluid dynamics analysis. The build itself will commence in late 2015 at the Multiplast yard in Vannes, which will be in charge of the project management. Delivery of the future maxi-multihull Gitana will take place in the spring – summer of 2017, which gives Sébastien Josse and the Mono60 Edmond de Rothschild the time to complete their Vendée Globe! Photo : Yvan Zedda/Gitana S.A.